The challenges of climate change are not always present in our daily lives but they will begin to shape much of what we do in the next 50 years. This is not just because the climate changes, it is about the speed, intensity and extent of change disrupting our life support systems. Because whether we admit it or not, 7 billion people use a phenomenal amount of natural resource and requires a complex system of commerce to distribute it to where most people live — over half the global population is urban. The biggest challenges of climate change are not the acute effects of more heat waves, droughts or cyclones on health and wellbeing but that uncertainty makes it harder for our systems of commerce, production and governance. Whatever your political view — and even if you lean towards climate change denial — spare a thought for what it means for a finite planet to have 7 billion people all wanting to improve their lives. #4 economics — the economics of paying for the direct impacts of climate change effects and the loss of economic activity, costs of mitigation and adaptation. A shift from traditional ways of doing business will always impose a cost. #5 politics — the political challenge of finding policies that can address all the other challenges. All these challenges are an extra cost to the public purse and the social consequences are many. The solutions will affect where and how we live. For example, the sea level will rise and there will be floods a plenty. There will be decisions to either move away from flood prone areas and low-lying coasts or stay and absorb the distress that happens when the flood comes. The key category that emerges from any difficult challenge is leadership. Solutions will not come from the true believers or from the skeptics for the extremities of the climate change issue are not what matters. Challenges of climate change are universal and as, as such, demand considered decisions, imagination, ideas and an empathy for what risk and uncertainty will do to the collective psyche. Most of all we need leaders with courage, for often the policy solutions must be those that win votes of the children and the grandchildren not the parents. 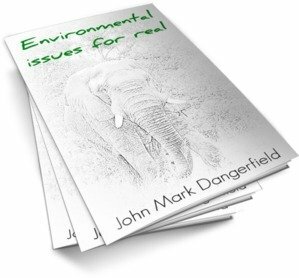 Environmental Issues for Real by Dr J. Mark Dangerfield looks at some of the obvious, and some of the not so obvious, challenges for a growing human population living as we do in a finite world. Only this time it's not about the impending disasters or the guilt or the blame. This time, it’s 10 brief essays that are about the bigger picture. In less than an hour you could glimpse something different, a view that we can only see when we take a fresh look.